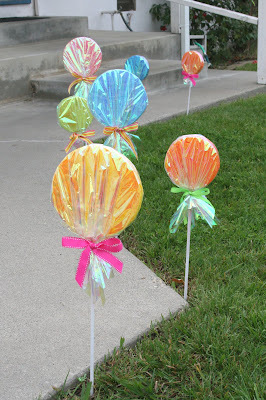 Since my daughter’s candy party (back in March) I’ve had lots of questions about the giant lollipops I made as decorations for the front walkway. 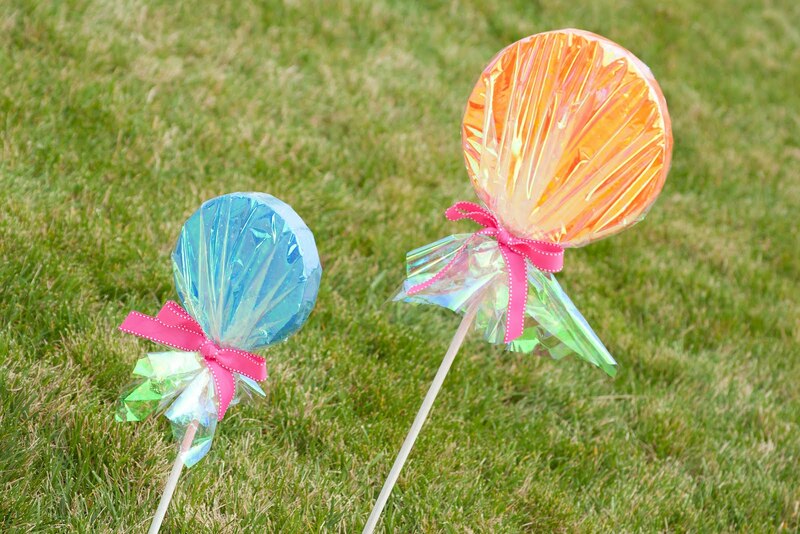 The idea is not my own, I found many similar lollipops on several different sites as I was gathering ideas for my daughter’s party. This was one of the many crafts I prepared weeks in advance. They are not hard to make, and can be used to add color and whimsy indoors or out. (I found them at Michael’s and Wal-Mart) The one surprising thing about this craft is that the styrofoam is actually quite expensive! The larger circles were close to $5.00 each. Step 1- Spray paint the wooden dowels white. Allow them to dry, then cut the dowels to desired lengths. 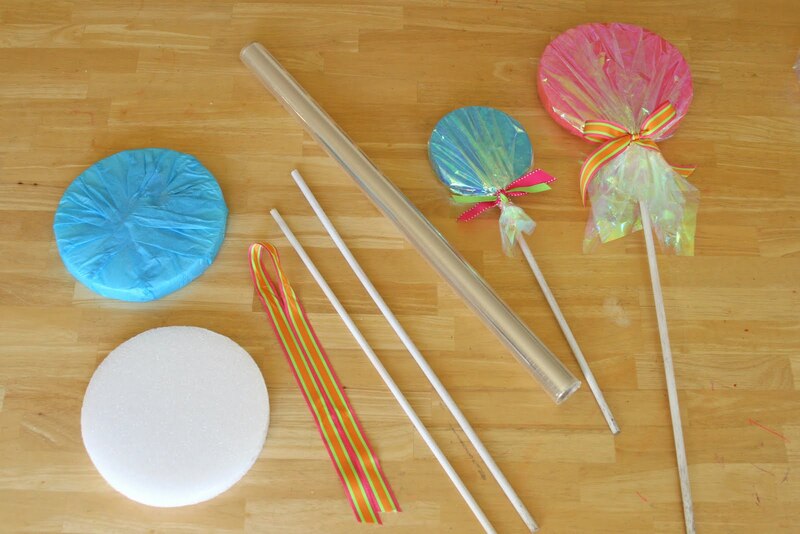 Step 2– Wrap styrofoam circles with colored tissue paper. Wrap them the best you can, but they don’t have to be perfect, because the cellophane will cover the imperfections pretty well. Step 3- Push a dowel into the wrapped styrofoam. If you want, you can put a little glue on the dowel before you push it in (I didn’t glue mine). 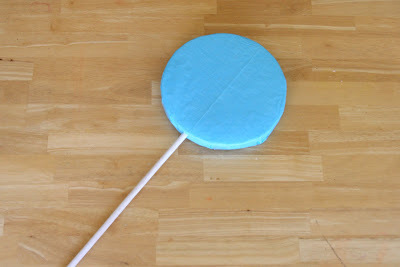 Step 4- Cut a piece of cellophane and wrap it over the styrofoam, gathering the ends around the dowel. 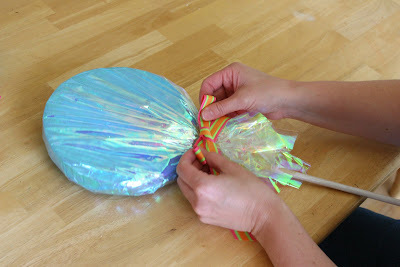 Step 5- Tie a piece of ribbon around the gathered cellophane, then make a bow. That’s it! 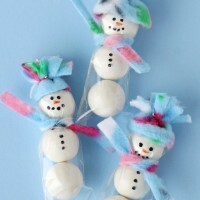 Adorable, calorie-free lollipops! 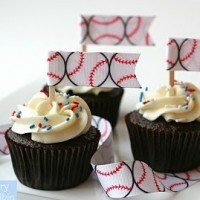 A fun way to welcome guests to a sweet party! Your parties rock and I am placing your blog on my blogroll!! Would love to have you post any of your fab ideas to my monthly Link party – It's all about celebrations and handmade parties! It's on every 1st Monday of every month. Hope to see you there? Very simple to do and very beautiful. Thank you so much for posting these instructions! 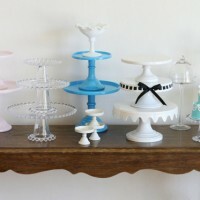 I'm doing a "Sweet Shoppe" party for my daughter in August and these will be part of my decor! I'm having a GREAT time collecting items for the party! 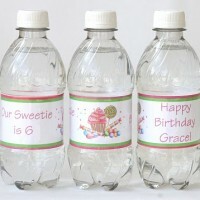 I also look forward to your instructions on how you made the personalized water bottles! DIDEM- The stamp I used on that cookie is a Martha Stewart brand alphabet set of acrylic stamps sold at Michaels. You can use any stamps (designed for paper). 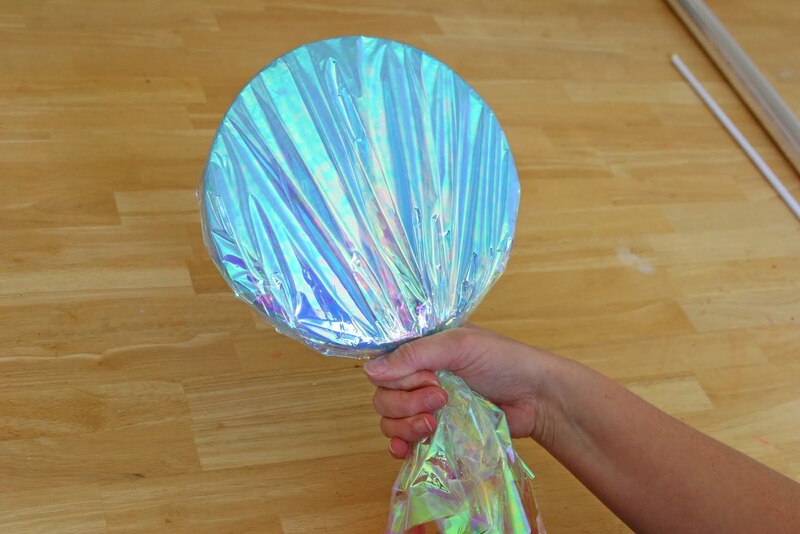 When I was a kid, we made huge lollipop's for our singing group to hold as props when we danced out of two paper plates stapled/glued together. Then we put colored cellophane over. i recently had a candy themed party..and wow i wish you would have made this in february and i could have seen them and made them for my party lol!! but oh well ..they are still super pretty!!! I found some inexpensive alternatives to buying the foam. Save any packing foam you get, or if you know of a company that deals in any type of foam ask for scraps. My father owns a business that has plenty of scrap foam laying around so we saved money there. Also I used a jig saw to cut my cirlces with, Great Job and very quick. 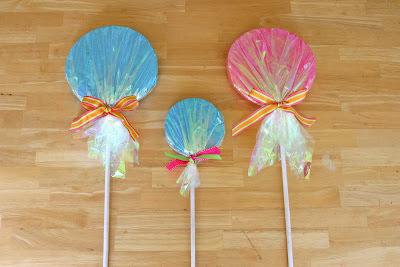 I soo wish you'd youtubed how to make the lollipops I'm having a heck of a time wrapping the tissue paper around the styrofoam! OMG!!! I'm doing a candy land theme for my daughter's birthday next month and sooooooo needed a decorating idea like this! THANK YOU!!! Great idea! Love the photos and instructions. Would love to share on my blog with your permission. Thanks again for the great ideas. @Trendy Tree- You are welcome to share one photo and a link to this post, please do not re-post the instructions or my how-to photos. Thanks! Too cute! I'm thinking of making these for my daughter's birthday. Do you know what size foam circles you used? 10inch? Thanks!! You are definitely a party planning inspiration! thanks for this cute idea! i plan to use this for my daughter's bday party this november. and i think this would look great as table centerpieces instead of balloons. thanks again! This is a cute theme! For a Candy Land themed outdoor Christmas decorations one year we made a lot of lollipops only we used two stryofoam paper plates and it was a lot cheaper. Glue two plates together facing each other, can be stuffed with newspapers for added strength, but not neccessary. Don't forget to glue dowl, may need to notch hole in plates before glueing if using large dowls. I just googled Lollipop decorations and this came up, I want to do a lollipop them for my baby girls room, she is due in march… and this is PERFECT!! You are so crafty!! You might consider using two paper plates, glued, insides toward each other, in place of the Styrofoam; a lot cheeper. Wow! I love these! very Creative! Just wanted to let you know that these are SUPER cute!!!! (Like you didn’t already know that, right??!!) I did find the styrofoam cirlces at my local Dollar Tree-they come in a 2 pack-they are smaller though-not the large size, but more of a cereal bowl size-so they would be great for decor around the house in jars, etc. Love your ideas!! Just wanted to add that you can get foam board at the Dollar Tree the size of posterboard for $1, and could get quite a few from 1 sheet of board. I LOVE these!!! OMG my girl’s sweets shoppe bday party is in 4 weeks and I am looking for unique decoration ideas! This will be perfect. I just have on question. How do they stand by themselves on the floor or table, if I used them indoors? You might be able to save money from buying styrofoam if you take either two plastic dishes or two cheap foil pie tins and staple them front to front, to give the illusion of puffiness. It was starting to get dark and Jeff has been gone a long time. canister stoves, they are not as convenient. health. Avocados- Although not my favorite, are high in fats, the good ones. Then leave it a while until your tummy lets you know that you’re hungry again before opting for a healthy snack. I just wanted to pop over and let you know that I’ve shared this post in an inspiration board for a Cute Candy Themed Birthday Party my blog. I have seen these made with colored paper plates (you could even use two facing each other for depth) and it’s a cheaper option. Great post! Thank you so much for the wonderful and simple instructions. My daughter has her birthday party next week and the theme is ” sweets”. This is EXACTELY the decorations I envisioned to put out sifted and welcome guests. Thank you , your post helped so much!!! You can also use the swimming pool tubes and roll them up. Paint them in different colors, even striping them, and then cover in the cellophane. I used this idea but used Frisbees and drilled holes in them for the sticks, that way each child at the party had a fun party favor. Dollar Tree also sells the styrofoam circles. They are much cheaper. I made basketball magnets with bows made of ribbon in the school colors for my niece’s basketball teams lockers. Parents decorate them during bb season. What size dowel rods did you use? Curious what size dowel rod you used? What’s length is the Wooden dowels ? I think the ones I purchased are were 36″ long, but you can cut them to any length you like. We are making these for a Girl Scout event. We have 19 girls and I am ordering 10″ circles, could you tell me about how cellaphone I should get. Hi Claire, Sounds like a fun project! If you’re using 10″ circles, I think you’ll probably want right about 1 yard of cellophane per lollipop. So that’s 19 yards, and of course I’d always suggest a bit extra just in case! =) Happy crafting!